Tatamotors has basked under the glory of Ratan Tata and he was candid enough to admit that the failure of Tata Nano was its being branded as the cheapest car. The concept was a novel one but probably the company failed in its marketing. we are providing below a technical perspective of the stock. Nonetheless it has done well abroad with Jaguar deal abroad and market has rerated the company. However remember that stock has to be traded as per the levels to make money and one must exit at the given levels as this movement in stock has happened courtesy Land Rover and Jaguar sales which has helped Tata Motors post solid third quarter earnings. As we can see that the chart of Tata Motors Limited is within a rising trend, which indicates a continued growth. 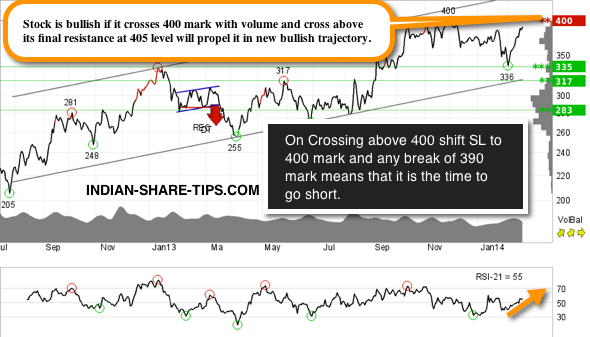 The stock has broken a resistance level and given a positive signal for the long-term trading range. Important point to note here is that the stock is testing the resistance at rupee 400, which may give a negative reaction. The stock will get into the fresh overall bullish mode once it is able to cross 400 mark with volumes and is able to surpass its final resistance at 405 level. However remember that Tatamotors is not doing well on the home front and one can not bask in the glory of a acquisition abroad and any break of 390 mark is a first signal that one need to exit from the stock and be on the sideline and if one still want to be in auto segment then Mahindra and Mahindra is a better bet which is doing well with its launch of vehicles like Duster to name a few. Our clients are long in the stock since its crossing 360 mark and if you also want to get super duper return stock then do remember to check the link and be a part of the winning team who have the best sources coupled with a great analysis team with tools which are par excellence. If you want to be in the market for a limited time say 2 hours then none can beat our intraday tip which performs irrespective of the condition in the market.